Original Sin Art: COMIC CON ANNOUNCEMENT! 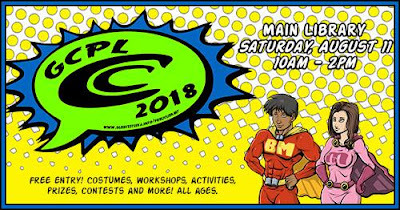 I am going to be vending my Steampunk jewelry and art at the upcoming Gloucester County Public Library Comic Con next Saturday! Woo hoo! This FREE event will be held at the main library, 6920 Main Street, Gloucester, VA, 23061, from 10:00 to 14:00 on Saturday 11th August, 2018. For more information, head HERE. There will be workshops, multiple sellers of awesome original products, activities, contests, and prizes. All ages are welcome, and of course, costumes are strongly encouraged. I have a fun costume all ready to go, but you'll have to come and see me if you want to know what it is! Last year there were over 3000 people joining in the fun, so they expect great things this year. I am so excited to be a part of this, and honoured to have been selected as a vendor. After this event, I only have one day to get ready before we leave for Ireland, so I have lots to do this week for the Comic Con and our trip, but it will be worth it! Now I'm off to create some new mini mixed media collages to bring with me to the Comic Con.